Already in February 2016 early works should begin in Saarbrücken, at the German/French border. Actuall construction progress will be seen in the spring, while entirely reinvented stadium will be available for fans from 2017 onwards. 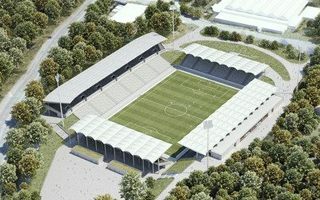 Reconstruction of Ludwigsparkstadion in Saarbrücken won’t be a complete one: the existing north grandstand will be retained, keeping some of the old ground’s feeling. Of course modernized, the stand will remain the largest part of the reconstructed new stadium. All remaining sides will change, bringing fans much closer to the action. Without the running track fans will be as close as 8.5m (along the sides) and 10m (west/east ends) to the players, nearly as close as international guidelines allow. Old landfill stands will be removed, but new ones will also utilize landfill to some extent. After all, the field is located below ground level, which means first several rows will be located in a sunken bowl. Upper sections are to be created with reinforced concrete and covered by light membrane roof. Behind the south grandstand a 3-floor pavilion will be created, comprising all the infrastructure necessary to provide hospitality to visitors. Existing floodlight masts will be retained both for sentimental and economic reasons (roof is too low to mount floodlights directly onto it). Altogether, the plan is a sensible one economically, priced at €16 million ($17.6m). Although capacity will decrease significantly from current (official) 35,000+ to 16,000. 10,000 fans will be seated, while remainder will be terracing.